> Great beekeeping year! Bees happy, healthy and growing. 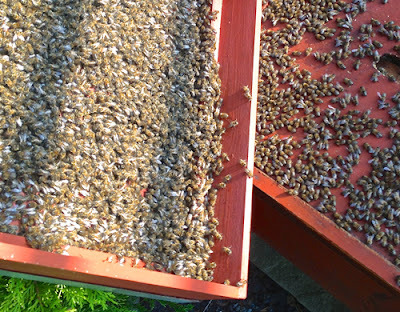 Many reports back from beekeeping friends is that this year for them was very poor with bee disease of all kinds. The latest bee health problem that stuck out was Paralysis Virus. Beekeepers finding dead bees all over the ground of their apiaries and bees clustering on the hive front ‘shivering’ hardly moving. We did not experience any problems this year, in facts the hives were exploding in population and honey gathering was at an all time high. Between you and I, we felt kind of guilty when beekeepers asked us how we were doing. We played in down to avoid upsetting anyone. 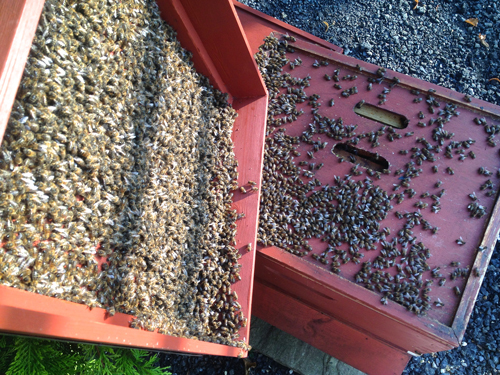 It’s all good news of course because the more young bees going into the winter the better. You need new fresh young bees because they will be the ones able to survive the long six months of winter ahead. Remember normally spring/summer bees only live for six weeks, so these young winter bees are really stretching their life span to be there in the spring to make it happen for the next generation. If you have any questions or advice please let us know.